Many travelers local and international find it a highlight of their holiday to join a boat safari and travel up the St Lucia Estuary. Seeing the hippopotamus and all the creatures the estuary has to offer. Each family that is seen along the hippo cruise has its own personality and the well trained guides share their insight to each pod. Hippos Love Grass and lots of it, they can consume upto 35 kg per evening, and can sleep up to 16 hours per day. There are two species of hippos in the world today, the Common Hippopotamus and the Pygmy Hippopotamus. Both are mammals that live in Africa, and each is a member of the family hippopotamidae. Over millions of years, many species of hippos existed. Some were as small as the pygmy hippos, but most were somewhere in between the size of pygmy and common hippos. The native ranges of these early hippos expanded across Africa and into the Middle East and Europe. Fossils of hippos have even turned up has far north as England. Eventual changes in climate and the expansion of humans throughout the Eurasian land mass limited where the hippos could go, and today they live only in Africa. Hippos are widely reported as relatives of the pig but recent studies show their closest relative would be cetacean, (whales and dolphins). Hippopotamus are generally nocturnal animals, spending the majority of the day resting in the cooler water. This is however almost a forced nocturnal behavior due to the fact that hippo cannot sweet and have very sensitive skin, best keeping their skin cool and moist during the hot African days. In fact hippo spend 80% of their lives in the water and for that reason are not part of the Big 5 as the Big five are regarded as the 5 most dangerous land animals to hunt on foot. Hippopotami do not sleep the entire day generally resting for periods of time and then having an active period but this is mostly spent in the water and it tends to be younger hippo that enjoy periods of play time within the water while the adult hippo sleep more often. The young hippo in St Lucia are often seen playing during the course of the day, this play time can last for 5 minutes or be as long as an hour. Generally all mammals play, play itself is an important life lesson. As mammals everything we know is taught to us, we need to learn to walk to talk to even hold things and most of what we learn come's from play. You would never find two birds or two snakes playing with each other as they are born instinctive, mammals however are born with the knowledge but have to be taught how to use it and that is where play comes in, teaching each other how to fight, how to protect themselves within a fight, all important skills to know for the future. Babies and sub adult hippo are often found play fighting and jumping straight out of the water, playing what can only be described as a type of ”tag”, chasing each other biting, jumping and then starting all over again or until the adults call them back towards the sleeping pod. Although Hippo spend a large amount of their life in the water, during certain times of the year especially during the winter months, it is common to find the hippo all resting out on the banks. It seems the hippo enjoy “sunbathing” to warm their bodies up during the cooler periods but the sun can create many problems for the hippo yet nature has a way to keep them safe. Hippos do not have sweat glands underneath their skin to release excess heat off the body unlike some other mammals including humans. While they rest on the banks a thin layer of light pink colored liquid is seen on their body. This liquid is not sweat. As they leave the water their skin becomes dry, in the dry air a hippo’s body loses water at a faster rate which is four times greater than that of a human being. So to prevent its dry skin from cracking nature has found a way and provided the hippo with a type of sun cream. The pink like secretion will fill up the hippos large pores and after filling the pores on the skin the liquid becomes somewhat dense and closes the poses to prevent any further water loss. Tests in international universities have confirmed that this skin secretion can block infectious growth as well as some ultraviolet light. The researchers named the newly identified red pigment hipposudoric acid and the orange one norhipposudoric acid. This special natural secretion not only protects the animal from the sun by deflecting the harmful UV rays but also protects the animal against infections that can be obtained through many open wounds found on their bodies during fighting. Early European settlers always believed that hippo sweat blood but now we know it’s the hippo’s special sun block and not blood at all. Families along the St Lucia estuary range between 5 to over 50 within their pods but other areas of Africa pod sizes have gone well over the 200 mark, especially during dry seasons where animals are compressed into a smaller body of water. The family dynamic of hippo can be rather complex and it seems that some areas may be different to others. Observing the families along the 3km boat safaris route, all seems rather similar. There is generally one dominant male within the pod, he is not necessarily the largest male but clearly has proven himself in fighting skills to be the most dominant. Within the group there will be other males of a similar age and size however as long as they have a submissive approach within the group then there will not be fighting. The other males act more like subordinates to the dominate male, even at times taking a mating roll but only if the dominant male is preoccupied with another female. The remaining hippo within the pod or bloat would be the females with their young. Whether or not there is a dominant female or cow within the group that seems hard to say for sure. The older females tend to take a more caring approach to young calves but there is no assistance with raising individual young during the first year of life. From the water it is not easy to tell male from female as many hippo look the same. Most people would immediately say the largest hippo within the group would be the male, this can identify the large males but for every other hippo its slightly more tricky. Trained eyes on the other hand can, but not with 100% accuracy, tell the difference with only the head sticking out of the water. Male hippo have much larger tusks then females reaching almost 50 cm in length, due to the extreme size of these lower tusks they would push up against the top jaw and lips forming a large bulge or bumps seemly next to the nostrils. The tusks of the cow hippo are not nearly as long as that of the bull and therefore do not have the same effect on the upper lip. On average a third of the tusk of a bull hippo can be seen in the mouth whilst two thirds are located inside of the jaw bone. The family group tend to be very territorial, in fact they are regarded as one of the most territorial aggressive herbivore species. The size of the territory depends on the body of water and the food supply. In the St Lucia Estuary the territories range between 100m2 to approximately 1km2. They will protect these territories aggressively against any other hippo coming into the area and have been known to even attack boats and other animals entering the home range. The aggressive approach on their territory does not seem to extend out of the water as one would expect, they seem to be somewhat calmer towards others while feeding at night on the land. So why the aggressive nature towards others within the water? As explained, hippo do not have the ability to sweet and staying out the water over long periods can dry out their skin and ultimately kill them, so protecting their body of water is not only to protect their families but to protect themselves. As if they were chased out the body of water they could die from sun exposure, the water is not only their home but also their life line. It has been recorded that during drought periods around Africa, when the hippos body of water starts to shrink in size they will even attack animals coming to drink from the water. 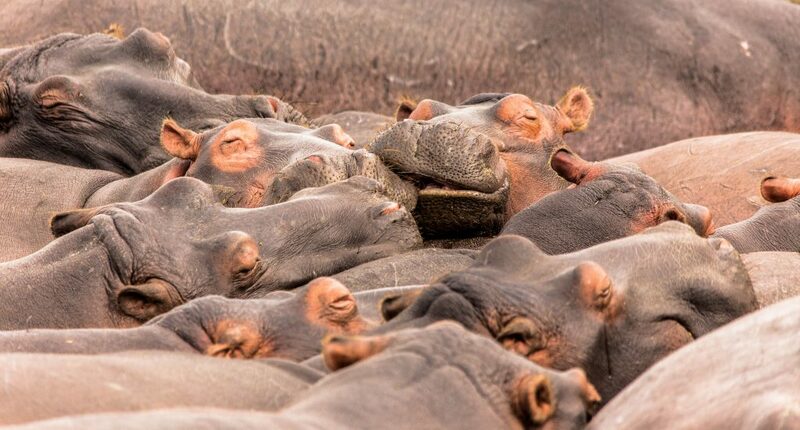 Often hippo families are found sleeping very close together, literally on top of each other. The reason for this close social behavior is uncertain but a theory behind this tight nit group is their nervous temperament. Hippos are generally nervous by nature, whether due to their poor eyes sight or just their general design. To make them feel safer and secure they enjoy resting very close to each other providing “comfort and support.” Now although resting so close together does allow the hippo this sense of comfort, hippos also have a very short temper and being so close to each other with such a short temper is a recipe for disaster. Fight's regularly brake out, it’s a matter of someone standing on someone’s toe, or something as silly as a bird landing on a hippo he jumps up because of being startled and it causes a chain reaction which leads to a fight. The short tempered fights within the group don’t last very long, a couple of seconds but the damage can be severe as young hippo that generally rest within the middle of the group could be caught between the fighting hippos and be fatally injured. When hippos sleep in the water during the day they generally prefer to sleep in areas of shallower water. They are not standing or floating when you see them sleeping but rather laying flat on their bellies. It does not mean however that the entire water body is shallow it just means that where the hippo are resting there is a small sand bank or island. If a sleeping hippo was to stand up straight in some cases almost half of their body would come out the water. Sleeping in the water can prove to be quiet a challenge for any mammal, most mammals when going into a deep sleep would drop under the water but then start choking which will quickly wake them up but not a hippo. Hippo as mentioned are very closely related to whales and dolphins and similar to these other aquatic animals hippo sleep with only one half of their brain at time. The Hippos front Teeth (Incisors) can reach and incredible 1.2 feet in length. That's not all the Canine Teeth can grow to a whopping 1.5 feet in length. The males teeth will be a bit larger than the females. Hippos also have the largest teeth of all land animals. 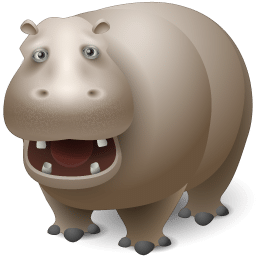 How do Hippos swim so Fast ? Hippos do not and can not swim, they in actual fact are running on the bottom. How Many Feet Do Hippos have? How do Hippos breath underwater? Hippos can not breath under water they breath with their nostrils when above the water and their nostrils close when under the water. How long can a Hippo hold its breath? A adult Hippo can hold its breath for up to 5 minutes.